WASHINGTON, DC -- As Ukraine wars with Russia and its agents in the east, it also faces an internal battle with military reformers seeking to modernize past the Soviet-era versus the country's bureaucracy, pervasive corruption and largely outmoded defense-industrial base. 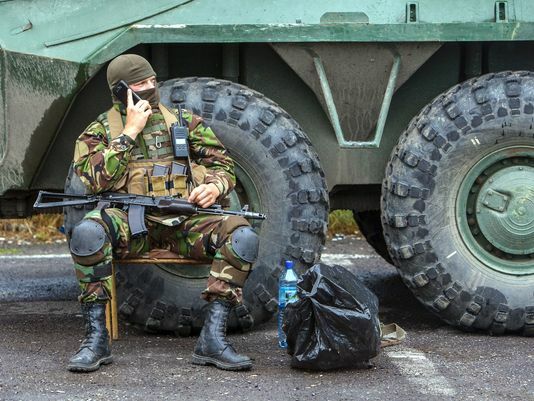 A Ukrainian serviceman talks on the phone July 13 at a checkpoint on a road leading to the village of Lavki near Mukacheve, Ukraine. The new government in Kiev, which took over following the 2014 ouster of pro-Russian President Viktor Yanukovych, is adopting NATO standards as the country sets sights on joining the US-led alliance. But to get there, defense officials say, the old ways need to go. "We are working hard because all the Ukrainian people are watching us, and we are like flags of the Ukrainian people, flags symbolic of future change for the Ukranian [nation]," said Konstiantyn Liesnik, an advisor to the Defense Ministry's reform office and head of its working group for logistics and procurement. "If we will change the Ministry of Defense, people believe we will change the whole country." The Ukrainian military, at worst considered corrupt and shabby, is under the administration of President Petro Poroshenko taking a serious look at both how it is organized and the defense industry's work, meant to make its military and defense industry truly effective, and to orient to the West. "Like everything else in the reform area of the Ukraine, this is going to be a tough slog," said John Herbst, director of the Atlantic Council's Dinu Patriciu Eurasia Center and a Bush administration ambassador to the Ukraine. "While the national interest is clear, the personal interest of some institutions and individuals do not necessarily line up. Corruption is a huge problem in that society, including in the defense sector." Military reform and transparency would not only thwart Russian efforts to destabilize and undermine the Ukranian government, but work to reassure potential donors of military aid that it will be used appropriately, said Olga Oliker, director of the Center for Russia and Eurasia and a senior international policy analyst at Rand. "Reforming the military and the national security sector is part and parcel of showing the world that, no, actually Ukraine is working, this government is effective and doing things no previous Ukrainian government could do," Oliker said. "Transparent, accountable militaries are probably militaries you can provide weapons to and be confident they will be used the way you expect them to." US lawmakers have urged President Barack Obama to provide Ukraine with lethal weapons, and the Wall Street Journal reports the Pentagon is seeking White House approval to provide Ukraine with bigger, longer-range radar after sending lightweight radar units and other nonlethal aid. The US is upping its commitment to military education for Ukraine. On July 24, the Obama administration announced it would extend training of the Ukrainian National Guard to the Ukrainian Armed Forces. That is notable, as it marks the start of the US training front-line military units that are actively engaged in the battle with separatists; previously, the units being trained were based in the Western, Kiev-controlled parts of the country. “This small unit training will be conducted by personnel from US Army Europe to help develop the internal defense capabilities and institutional training capacity of Ukraine's Armed Forces, and is similar to our ongoing training of the National Guard, announced in March,” Pentagon spokeswoman Laura Seal said in a statement. Asked what equipment the Ukrainian military could use from the US, Liesnik and other Ukrainian officials at a press conference at Washington's Ukrainian Embassy on July 23, called out a wish list that included anti-tank systems, armored vehicles, counter-battery radars, electronic reconnaissance systems, jamming and anti-jamming systems, and NATO-standard replacements for Soviet-era radios. It has been widely reported that Ukrainian troops are struggling to counter artillery fire and electronic jamming. "The problem with Russia against Ukraine is we use similar Soviet Union systems, like radios, like counter-radios, and its a problem [that] we work in the same way," Liesnik said. Ukrainian officials at the event said they were confident that with or without foreign support, Ukraine will win the war. The difference, said Military Attaché Col. Serhii Dolenko, is foreign support could lessen the number of dead. "My personal opinion and the opinion of the Ukrainian people is yeah, we need support, we need guns, but if you will not give us these guns, we will win any time," Liesnik said. "Any war we will finish, and after the war, we will remember who helped and who did not." Herbst forecast much larger, more effective and serious foreign support for Ukraine over time, led by the US — though it has so far been meted out too cautiously for some. Herbst, author of a report calling for the US to arm Ukraine, said the two most important systems the US can send are shoulder-fired Javelin anti-tank weapons and counter-battery radars. "The White House has in my judgement been strategically myopic, where other parts of government at the senior levels understand the strategic stakes," Herbst said. "The White House does not get it, and it's quite appalling." The US, traditionally cautious about sending weapons and materiel, is concerned that they will be lost or stolen, and in this case, there is not a strong history of the US aiding Ukraine with satisfactory results, Oliker said. To boot, the US has already sent nonlethal aid that satisfies most of what Ukraine needs, she said, versus anti-tank weapons that may require substantial training. Oliker argued that Ukrainian victory against the militarily dominant Russia will have to be political. Though US aid could be a political tool that shows its backing, but the US has made clear that backing will not include troops, so it is of limited effect. Ukraine is, for its part, inching toward the cautious West. Part of the Ukraine's pivot away from Russia is evident in the adoption of NATO military standards or stanags, short for standardization agreements. In revamping its military kit, a portion of the effort across the Defense Ministry, the aim is to meet 22 stanags out of roughly 40 in the sector by year's end. Ukraine's military reform effort must overcome huge obstacles, and NATO membership, if not a long-shot, is a long way off, analysts said. Still, the hope of NATO membership is a huge incentive for Ukraine to spur useful changes that it might not otherwise make, said Julie Smith, senior fellow and director of the Strategy and Statecraft Program at the Center for a New American Security. "It's an enormously high wall to climb, but [NATO standards] are some of the best standards you can hope for," Smith said. "Rather than coming up with their own plan or following the lead of another country in the neighborhood, the good news is NATO provides a lot of concrete steps and goals — though they [Ukraine] may find a lot of them out of reach while they're dealing with Russian aggression." Several officials from the Defense Ministry's reform office, including Liesnik, were in Washington for a few days to discuss best practices with the US Army's procurement office for soldier equipment, PEO Soldier, at Fort Belvoir, Virginia; the US Naval Academy in Annapolis, Maryland; and Walter Reed Military Medical Center in Maryland. Ukrainian officials said they were able to see US Army gear on the visit, but access to Western equipment is likely to remain limited. That is going to make it more difficult for Ukraine to meet NATO interoperability requirements, but Ukraine should still be able to make considerable progress with what it has until greater access is provided, said Paul Schwartz, of the Center for Strategic and International Studies' Russia and Eurasia Program. Reforming the defense industry would also make a big difference, Schwartz said. Yet Ukraine's defense industry has survived largely on exports, especially to Russia, and has had to adjust since access to Russian markets was cut off. The loss of key suppliers in Crimea and the rebel-held Donbas has generated further problems. "The increase in state orders has helped somewhat to fill the gap," Schwartz said. "But in the long run, additional investment will be needed to help Ukraine's defense industry to modernize and to become more integrated into Western supply chains. However, given the current level of corruption in the system, outside investors may hesitate to become involved." Ukraine is working with its local suppliers to improve the quality of soldier equipment like body armor and uniforms, and to meet NATO standards. Ukrainian military clothing had retained its Soviet-era style and simplicity, but quality fell after Ukrainian independence in 1991. Instead of being flame-resistant, some fabrics would melt, Liesnik said. The reform council has developed a "personal unified combat kit" of 65 items, each manufactured to standard, with a national stock number that is traceable to a supplier and meant to prevent black market sales. This kit will include new uniforms, a symbolic and practical step forward. At the embassy, Liesnik and his team were wearing a unique camouflage pattern of Liesnik's design called "lizard," which would be distributed to the force next year, he said. A new dress uniform in the works will replace a Soviet-style uniform that basically swapped the red star for the Ukrainian yellow-and-blue flag. "It's important for our great Army to have their own uniform," Liesnik said, "a new Army, a new face of the Army. Beyond uniforms, the Defense Ministry is looking to both domestic and foreign suppliers. The plan is to offer two defense tenders for electronics, likely equipment Ukrainians lack the know-how to manufacture locally. "We are trying to grow our manufacturing, but we really don't care about where it should be made," Liesnik said of military equipment. "We want to have the best quality at the best price in a short time. We are the Ministry of Defense, not the Ministry of Economics."